Coronation, Alberta – On February 11, 2019 at 4:13 a.m., Coronation RCMP, Coronation EMS and the Coronation and Castor Fire Departments responded to a complaint involving a two vehicle collision at the intersection of Highway 12 and Range Road 110 near the town of Coronation. Two semi-tractor trailer units were travelling eastbound on Highway 12. 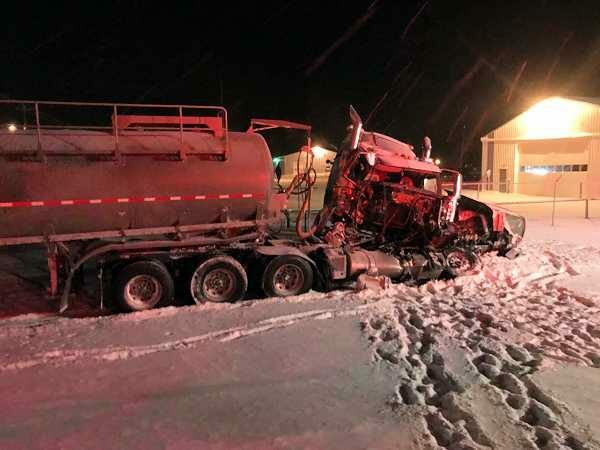 The leading tractor-trailer attempted to make a northbound turn onto Range Road 110 from Highway 12 when a rear-end collision occurred between the two tractor trailers. The adult male driver and lone occupant of the rear tractor-trailer was transported to the Castor hospital to treat his injuries. Coronation RCMP, Coronation EMS and the Coronation and Castor Fire Departments responded to a complaint involving a two vehicle collision at the intersection of Highway 12 and Range Road 110 near the town of Coronation. The driver and lone occupant of the lead tractor trailer was not injured. Poor road conditions due to recent snow fall was a leading factor in the collision. Coronation RCMP would like to take this time to remind the public to drive with particular due care and attention this time of year. Winter brings low visibility and treacherous roads which can result in various road hazards. Paying close attention to the weather, road conditions and the speed and distance created between your vehicle and other motorists can significantly decrease the risk of a motor vehicle collision.